Amazon Web Services Simple Storage Service (S3) is the solution for anyone wishing to store or deliver massive amounts of data without eating up precious bandwidth on their own server. Amazon S3 works great for your computer and web hosting needs. 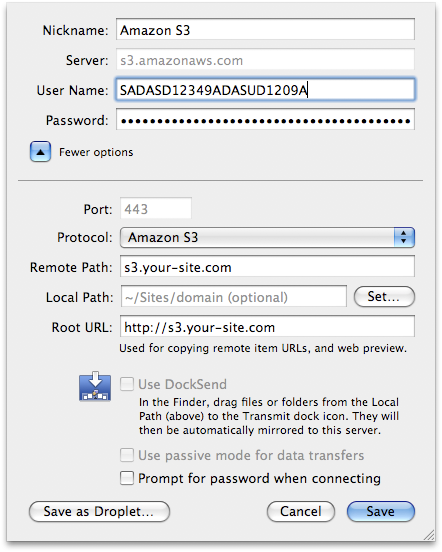 Getting started with Amazon S3 is simple and takes no more than a few minutes. Once registered and confirmed, access to your account can be achieved using your account identifiers and an S3 client like S3Fox, S3Hub, or Transmit. Want an estimate based on the amount of data, bandwidth, or requests you expect to offload to Amazon S3? Check out the AWS Simple Monthly Calculator. Managing your files on Amazon S3 is not much different from managing files on your own server via FTP. Users need to understand that Amazon uses "buckets" as the top level for your objects. This means that you can separate your different file hosting needs using different buckets. For this introduction to S3 file hosting, we’ll use the example website your-site.com. The most important step is adding the appropriate CNAME record to your DNS settings. Expect your new DNS settings to take up to 24-48 hours to resolve. These settings assume that you have a single custom bucket to reflect your S3 hosted files CNAME record. Looking for an even more integrated S3 file hosting with your WordPress install? Check out the Amazon S3 plugin for WordPress. Installation is straightforward. The only requirement aside from an S3 account is that your server be PHP5 enabled. The S3 WordPress plugin will support the previously configured virtual host s3.your-site.com/some-file.txt and provide direct upload from the post editor window. To supplement my Time Machine and external SuperDuper backups, I rely on Jungle Disk to do the same in the cloud – the S3 cloud. I enjoy the convenience and peace of mind knowing that my data is safe and easily accessible. That same convenience can be extended to file hosting. S3Hub – View your S3 online storage, upload, download, set permissions, share with friends and more. Also use to view other users’ public buckets. S3Fox Organizer – Manage your S3 buckets using this handy Firefox extension. Shrub – Shrub lists files in public S3 buckets. For when you want to share a bucket with the world. Tutorial: How-to make files public – A walk through if you are not all ready familiar with the world, authenticated users, and owners permissions. FuseOverAmazon – FUSE based file system backups powered by Amazon S3. Getting started with Amazon CloudFront – Paul walks through the steps to get started delivering content via Amazon CloudFront. Are you using Amazon S3? If so, how? Personal backups, file sharing, development?